The LDCM observatory will launch from Space Launch Complex-3E at Vandenberg Air Force Base aboard an Atlas V 401 launch vehicle built by the United Launch Alliance (ULA). This rocket is an evolved expendable launch vehicle capable of placing a 9370 kg satellite in low-Earth orbit. This capability offers ample mass margin for the LDCM observatory. A 4 m-diameter extended payload fairing will encapsulate the observatory atop the rocket through launch. The NASA Kennedy Space Center selected the Atlas V 401 for LDCM in December 2009. 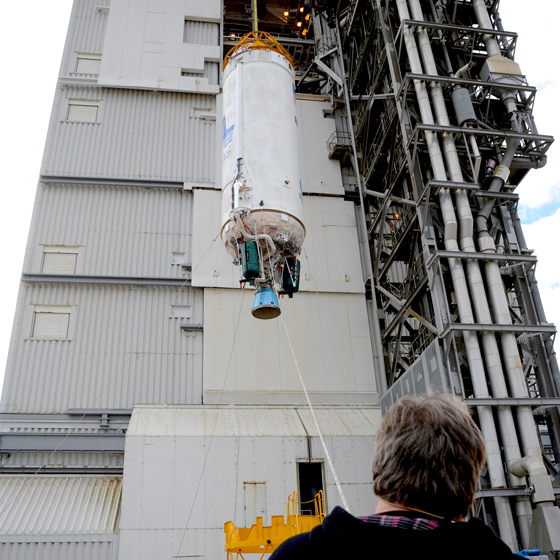 VANDENBERG AFB, Calif. – A Centaur upper stage is lifted onto the first stage booster of a United Launch Alliance Atlas V at the launch pad at Space launch Complex-3E at Vandenberg Air Force Base, Calif. in preparation for the launch of the Landsat Data Continuation Mission. The Landsat Data Continuity Mission LDCM is the future of Landsat satellites. It will continue to obtain valuable data and imagery to be used in agriculture, education, business, science, and government. The Landsat Program provides repetitive acquisition of high resolution multispectral data of the Earth’s surface on a global basis. The data from the Landsat spacecraft constitute the longest record of the Earth’s continental surfaces as seen from space. It is a record unmatched in quality, detail, coverage, and value. Launch is planned for Feb. 2013.